Set your Cobalt or G5 apart from the rest! These awesome body side graphics are designed to fit perfectly on your vehicle's lower door panel as shown. Utilizing unique fade patterns, graphic appears 3 dimensional with a simulated vent at the front and spears that narrow to the rear as shown. Available in four (4) Fade colors (Black Fades shown). 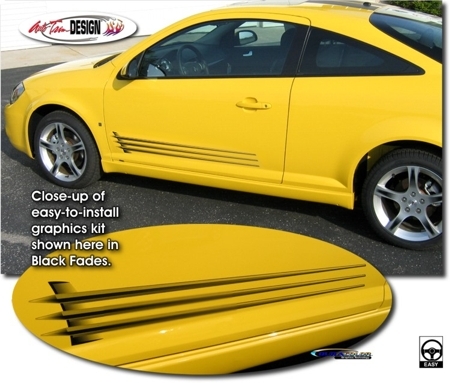 Very easy to install (slight trimming required at door jamb on Cobalt or G5 Sedan models), this graphic kit measures 46.352"x 5.85" (117.73cm x 14.86cm) and will fit any '05-'10 Chevrolet Cobalt or '07-'09 Pontiac G5. While graphic item is listed and shown here for the Chevrolet Cobalt or Pontiac G5, this graphic will look great on just about any vehicle!